From SMSgt Bart Day -- "Balls 18 is C-141 tail number 67-0018." The "where the hell is balls 18?" 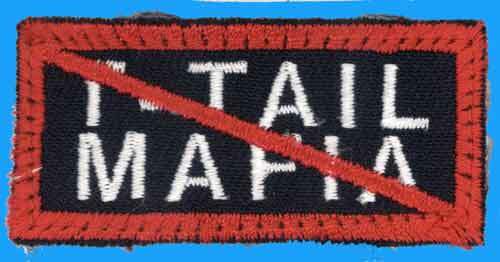 patch was from a 4th MAS SID we did in the early 1990's. I was in the 4th MAS at the time. I'll have to check with a friend of mine because my memory isn't what it used to be, but I think the jet broke somewhere really nice, and nobody could figure out where they were for quite awhile. So, some of the guys had the patch made up to harass the crew. 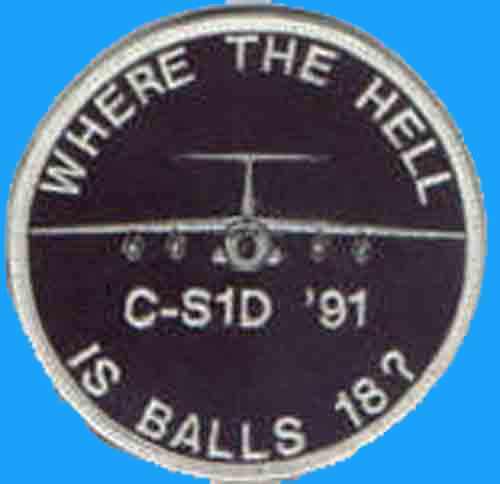 From Wogamonmd -- "The balls 18 on the patch refers to a C-141 tail number not an individual. The aircraft used to transit Kadena frequently when I was stationed at the 603d from 86-96. The aircraft is a west coast bird but can't remember if it came from Travis or Norton." From Steve Kernstock -- "This patch was undoubtedly made by/for Norton or McChord C-141 squadrons who, starting around 1990, would deploy small detachments (2 to 5 planes) to Clark AB (C-SID) or Yokota AB (Y-SID). SID stood for Strategic Intra-theater Deployment. The jets and crews would stay for 2 weeks, more or less, and fly missions within the WestPac. It was envisioned as a way to cut down on the non-productive ferry time back and forth across the Pacific as well as a way to foster some much needed esprit de corps in the strategic airlift squadrons. When Mt Pinatubo blew up, the C-SID moved to Kadena, becoming the K-SID. The SIDs kind of melted away when Desert Storm soaked up all the strategic lift, and never came back." Even the C-5 flight crews that picked up the completed Senior Trend aircraft from Burbank had their patch-a black circle with a white crescent moon and a large question mark. 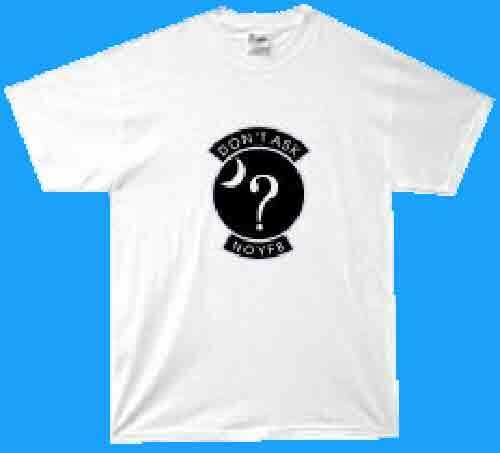 On a tab at the top of the patch was "DON'T ASK!," while another tab at the bottom carried the letters "NOYFB." (None Of Your F#@! *#% Business). From Dan Tasca -- "This patch dates back to the production days of the F-117A Program. As a F-117A was rolled off of the production line, it was readied for delivery to the Air Force via a C-5 Galaxy. Soon after this mission, this patch was designed. This information was from the book "Nighthawks: Insignia of the Lockheed F-117A Stealth Fighter" by Patrick Blazek. There is more information on this patch and other F-117A patches in this book." From Eric Czerwinski -- "Patch was used by Travis C-5 aircrews who were top secret cleared while on their missions. The patch used to have on the top tab "What's up?" The MYOFB means "Mind your own F***ing Business". I tried many times to get this patch with no luck!" From Kenny Rushing -- "I received this patch from a Diplomatic Courier from D.C. while on a Lofty Crown (U.S. Embassy resupply mission) mid 90's." From Peter Merlin -- "This patch is from the 20th Military Airlift Squadron and represents classified airlift operations, but not necessarily related to the F-117A. I don't know. The patch for C-5 crews transporting F-117A airframes to Groom Lake in the 1980s was from the 22nd MAS and did not feature a picture of the aircraft. Notice that this patch depicts a C-141. A fake version of the C-5 patch is available in England. It is identifiable because the lower tab reads IT'S NOYFB instead of NOYFB as on the original." From Steve Kernstock -- "all those C-5 comments have to be off base. The aircraft depicted is, unquestionably, a C-141." From Michael E. Cawthon -- "The story regarding this patch is kind of close, but many facts are incorrect. I originally designed the patch when I was assigned to the 22nd MAS as a loadmaster, flying these missions, and still have the original. There never was a squadron designation, nor an aircraft picture. The shape comes from the 22nd MAS patch (before it became the 22nd AS). The black represented the night time operations, the silver (or originally white) was for the star light. The crescent moons speaks for itself, the question mark was for the classified operations. NOYFB was just that, None Of Your F****** Business; Don't Ask was to tell you not to ask. There never was a "What's Up" tab, nor tails on the lower tab. I had originally written a heraldry document for this patch, but that went the way of Windows 2.0. 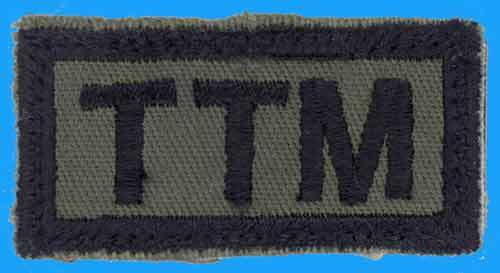 The only rule was that each qualified and identified crewmember would get two patches: if you gave them away or traded them, tough luck, no replacements. I never heard of the person who sent you this patch, but I guarantee it is a knock-off." From Keith B. Boughner -- "I can vouch for Mike Cawthon's story. I still have my two patches, one's in a frame along with a picture of the last time the "Item" went up the forward ramp."